PHOENIX – Supporting a plan to extend the Valley’s light-rail system five miles into south Phoenix is part of the Obama administration’s commitment to improving public transportation, roads, bridges and rail, a visiting federal official said Tuesday. “We are doing everything we can to work with Congress, the Obama administration and others to make sure we as a country invest in our infrastructure,” U.S. Deputy Transportation Secretary Victor Mendez said while touring three proposed light-rail stations with Mayor Greg Stanton. Earlier this month, the city received $1.6 million in matching federal funding to conduct an environmental assessment and conceptual engineering for the extension, which is to run from Jefferson Street to Baseline Road along Central Avenue. Stanton said there is no better place than south Phoenix for using transportation to advance economic opportunity for an area and its residents. Noting that the area has the city’s highest transit ridership, Stanton said the proposed extension will bring in investment and education opportunities that will improve the lives of residents. “Not only will it connect people from South Mountain Village to the rest of the city, it will connect the rest of the city to South Mountain Village in a way that has never been done before,” he said. Kate Gallego, the city councilwoman representing the area, said the start of construction depends on how quickly the city can find the funding. A committee of transportation leaders is studying ways to do that for the south Phoenix extension and other projects, she noted. Eva O. Olivas, executive director of Phoenix Revitalization Corporation and a resident of the area between downtown and south Phoenix, said the project means connection and engagement. “We are excited about the possibility of development, the possibility of local jobs,” she said. 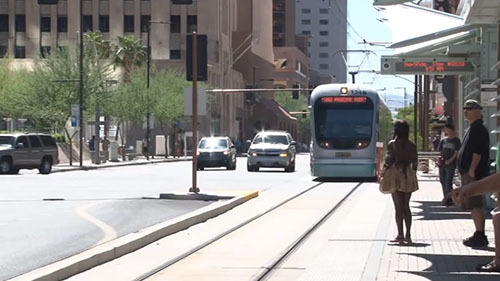 The US Department of Transportation awarded the City of Phoenix a federal grant to help pay for light rail improvements and expansion. The new section will connect with the South Central Phoenix Corridor. Reporter Katrina Arroyos has more. 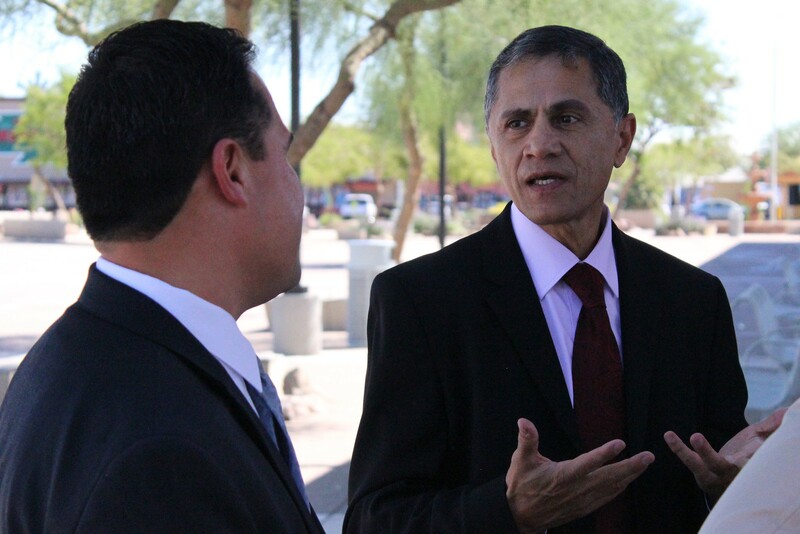 U.S. Deputy Transportation Secretary Victor Mendez, right, visited light-rail stations proposed for south Phoenix during a tour Tuesday.